Deciding to automate your canvas shop can seem like an especially difficult decision if everything you make is custom. This was particularly true for Len’s Awning in Sioux Falls, SD where owner Len is the first to say he isn’t tech savvy. However, where Len is new to tech, he is old hat with hard work. His old work flow included countless hours spent on weekends and after-six evenings cutting simple projects like upholstery trim strips, speed boat window reinforcement patches, and boat covers for the local dealership. Len wanted a Plotting/Cutting/Patterning solution simple enough to automate these basic, but time consuming jobs TODAY, but advanced enough to allow him to help his business’s future by building a digital pattern library, designing awnings and canvas in CAD, and eventually integrating 3D Digitizing over the course of the next year. 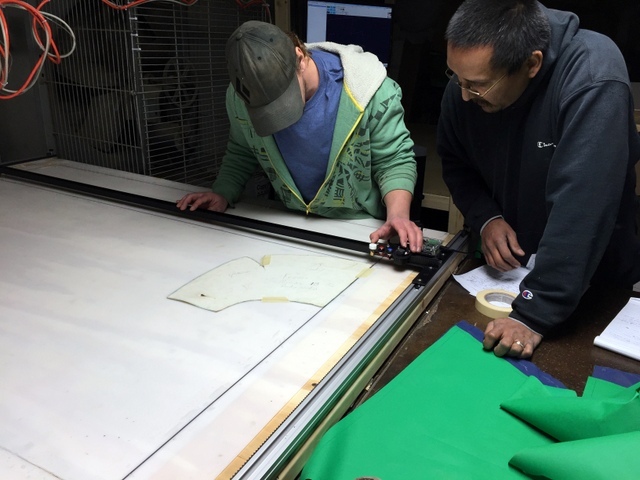 He found his simple and affordable solution with the Carlson Design Pro PT-72″ Plotter/Cutter and T-Bar Pattern Digitizer. Calculating the return on investment (ROI) from this system. How they started cutting basic patterns, like trim strips. How they digitize their existing patterns. How everyone in Len’s shop learned to draw an awning in CAD. 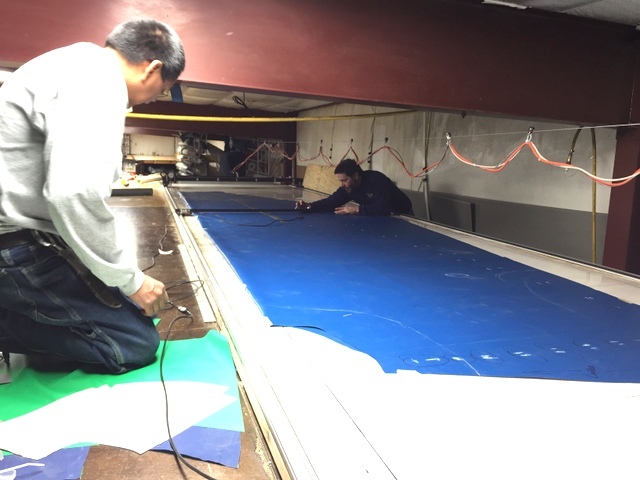 How to digitize and cut a full sized boat cover. 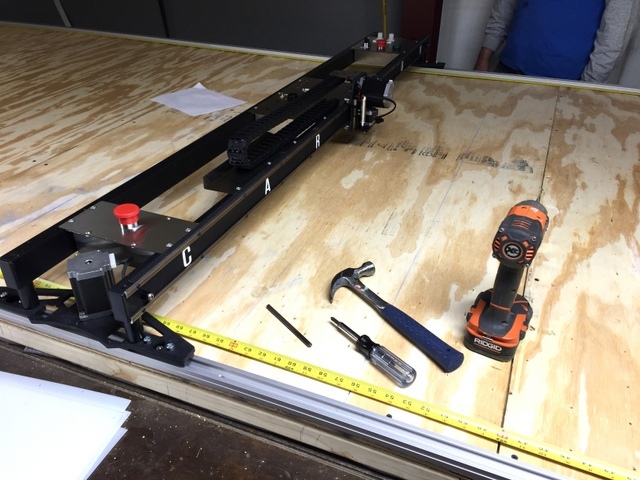 How we installed a Plotter/Cutter on their home built vacuum table. 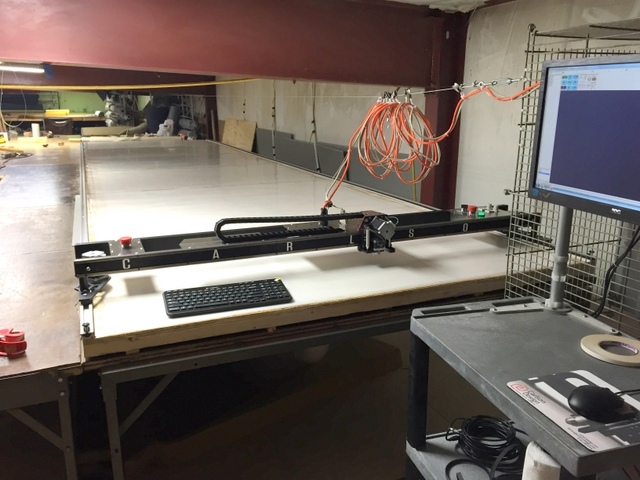 Carlson PT-72″ Plotter/Cutter on a home built 24′ long vacuum table at Len’s Awning. Carlson T-Bar 2D Pattern Digitizer. Thumbs Up! Len’s Awning has an amazing team. 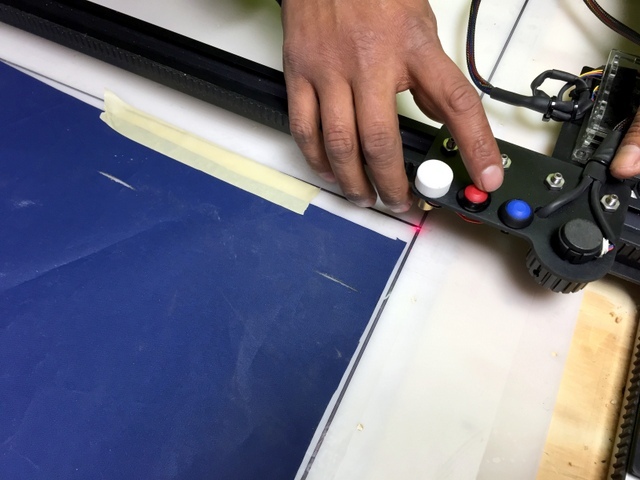 Calculating your return on investment with a CNC Plotter/Cutter and Digitizer is often difficult if everything you cut is custom. But is everything you cut really custom? 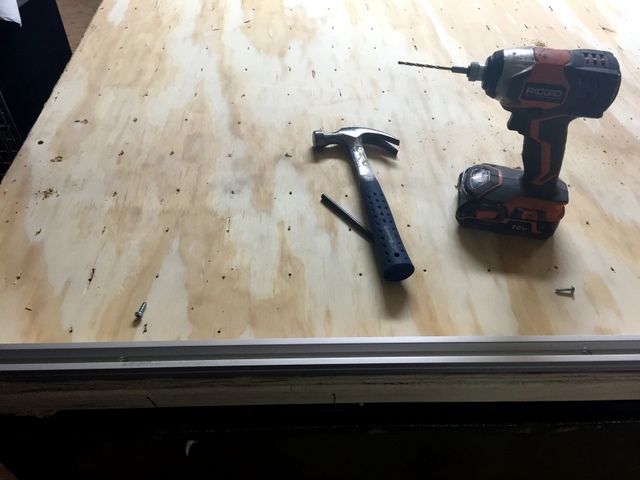 It took 6:30 to cut a couple tables full of 3″ Upholstery trim strips. By hand “they would have taken days”. Many shops think the only way they can afford to automate is by solving their most complicated problems with the most complicated and expensive CNC equipment solutions. If you can’t feed cloth in one side and spit out boat covers on the other, don’t waste my time! 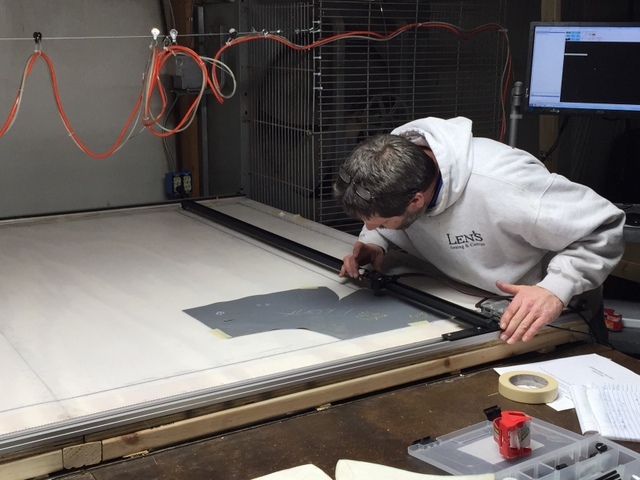 Len’s Awning understands the true value of an hour, the time it takes to integrate a new process into their shop, and that the first step toward a return on investment is making the investment. That’s why they began by automating their simplest projects, with a simple, yet scalable system. 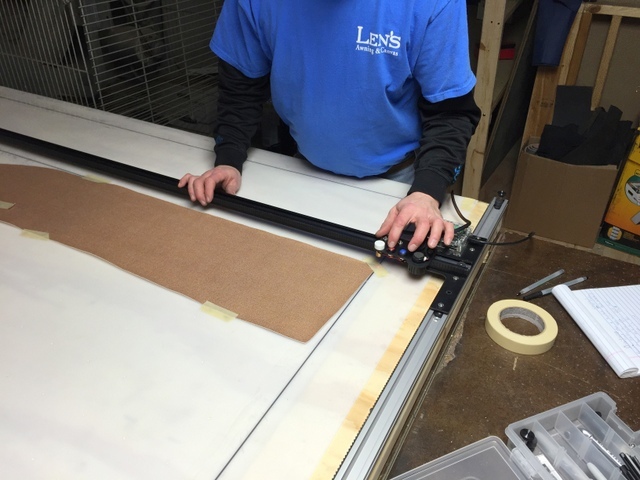 Over the next year Len will save hundreds of hours cutting basic jobs, digitize hundreds of patterns for more complicated jobs, all while training his staff to understand CAD and digital patterning so they can eventually tackle automating all of their custom canvas work. Keeping your best people working on your hardest projects. Improving plot/cut quality which speeds up your sewers. Building a digital pattern library to speed up re-cuts, recovers, and build company value with a customer pattern database. Creating a technological barrier to entry for your local canvas market. Allowing you to quote new and larger projects. Woody trains Jen, Len’s Awning’s newest employee. 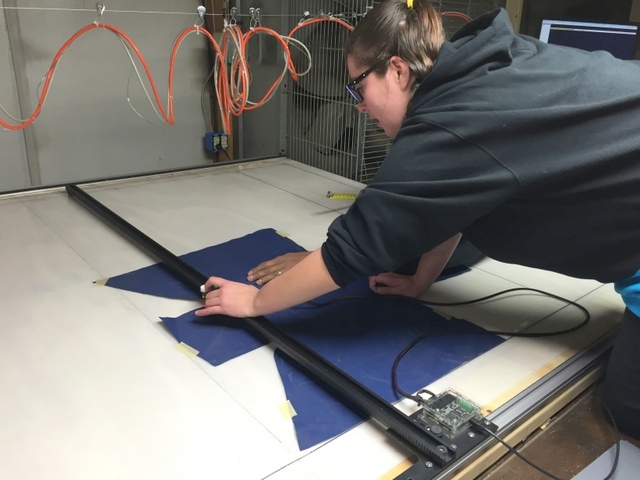 Jen is new to the canvas industry and new to CNC equipment, however she is already able to digitize patterns, draw basic awnings, and plot/cut finished product. Starting simple doesn’t mean you can’t plot/cut complex patterns. 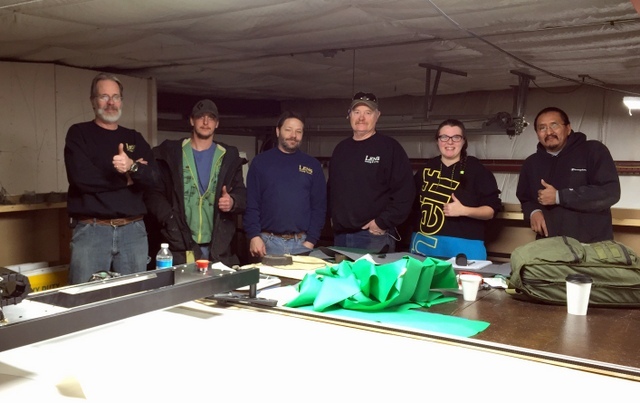 Len’s awning has a large collection of paper and cloth patterns spanning over three decades. 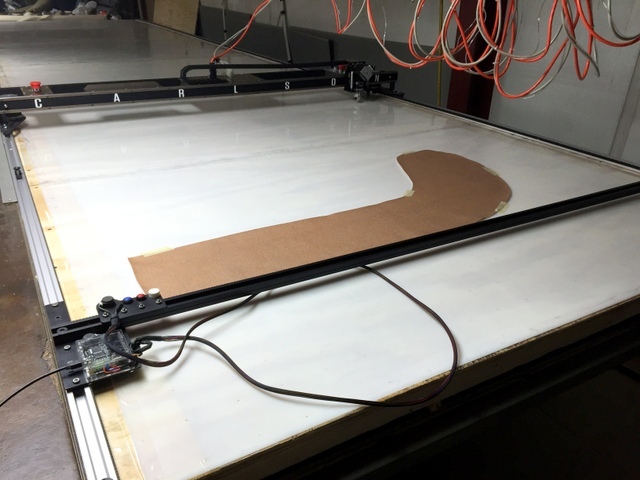 Using the Carlson T-Bar 2D Pattern Digitizer they can “trace” their physical patterns to create a digital copy that can be nested and plot/cut using their Carlson Plotter/Cutter. Below are step-by-step instructions for digitizing and then plot/cut a popular reinforcement strip. They spent over 300 hours cutting this particular pattern last summer. 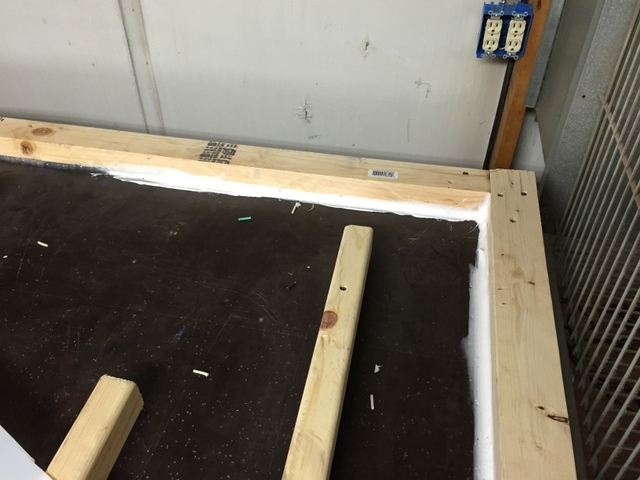 Step 1: Secure the pattern on the vacuum table. Step 2: Use your hand to walk the targeting laser around the pattern, recording significant nodes using either the plot or cut record button. Accurately cutting cloth does not require thousands of points. 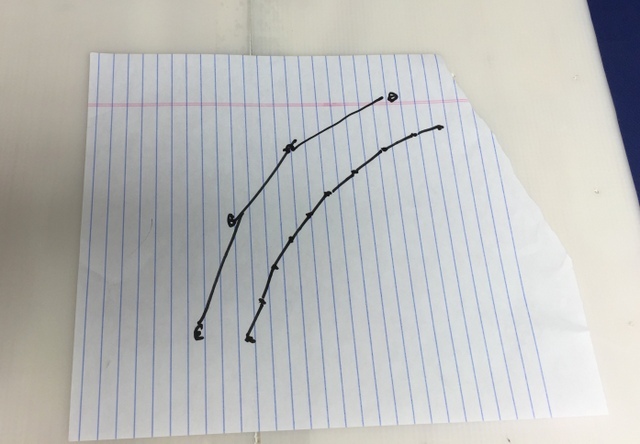 During training we explain how to digitize a curve without inserting too many points. Step 3: Watch the pattern take shape on the computer. 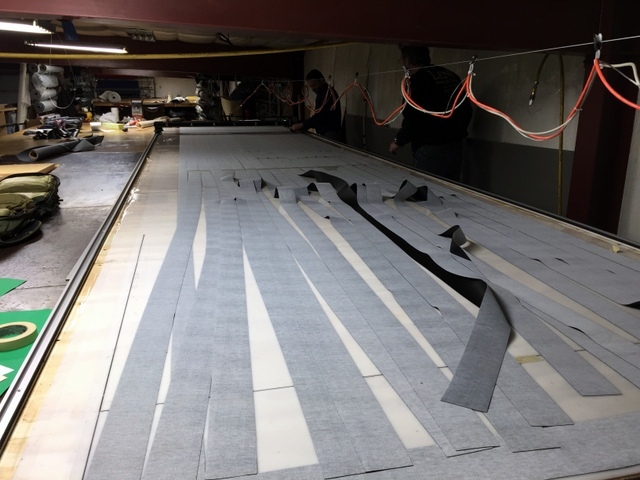 Using our simple software the operator can edit or add points, add a seam allowance, add text, or nest the shape with other patterns to optimize material yield. Step 4: The finished pattern is ready to be Plot/Cut! Click here to watch four patches cutting in less than 50 seconds! 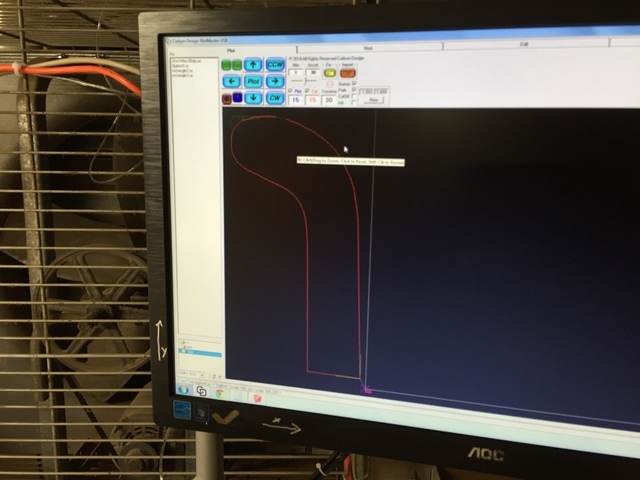 The T-Bar Digitizer is so simple to use that anyone in the shop, regardless of their patterning or computer experience, can create a digital plot/cut file. 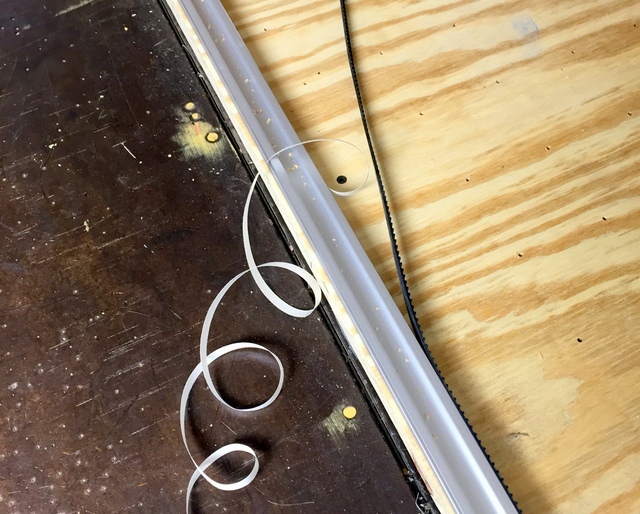 The T-Bar will even help you improve your physical patterns by turning almost straight lines into actual straight lines, fixing missing or rounded corners, and smoothing arcs. 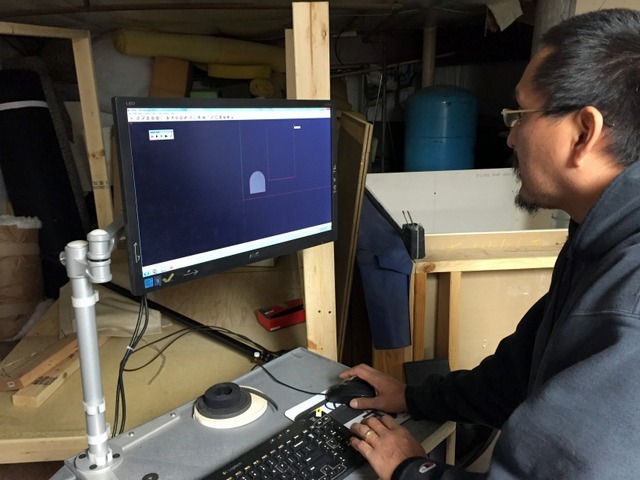 Bradly digitizing a pontoon boot. Woody training one of the welders, Wes, to digitize. Click here to see Wes digitizing in real time and real scale! Jen digititizing a 15HP Johnson motor cover. If you know a corner is supposed to be square, go ahead and correct it when digitizing. 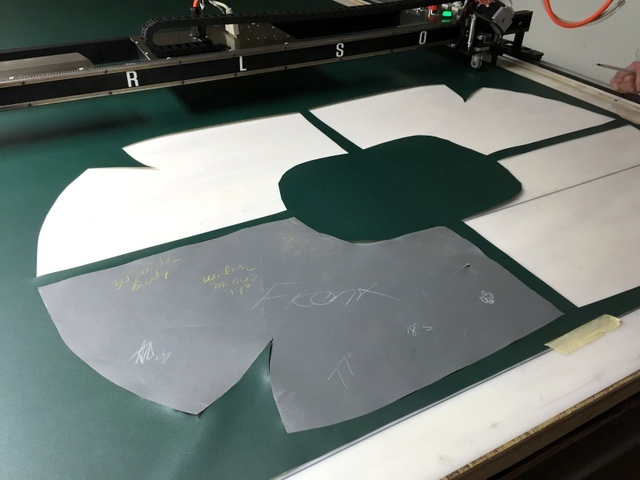 Watch Woody train Jen to cut her first digitized pattern! This video is a must see! It takes less than a minute to cut and Jen is all smiles when it’s done. Not to shabby for someone who has never cut or patterned canvas. Woody checking Jen’s digitized and cut pattern. It looks great! Checking Tony’s cut pattern. Another home run! See four digitized pontoon boots cut in 1:29 out of Aqualon! 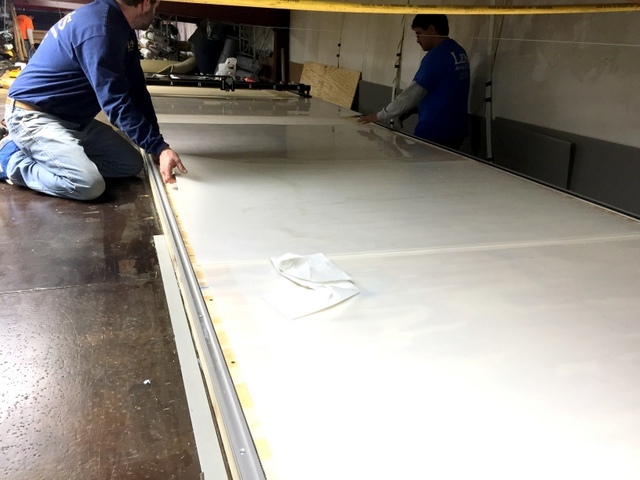 Len’s awning does a lot of work for local boat dealers, replacing OEM boat covers or providing new canvas. Every year they update their patterns to accommodate the latest models, which could mean 10-20 new full sized cover patterns. 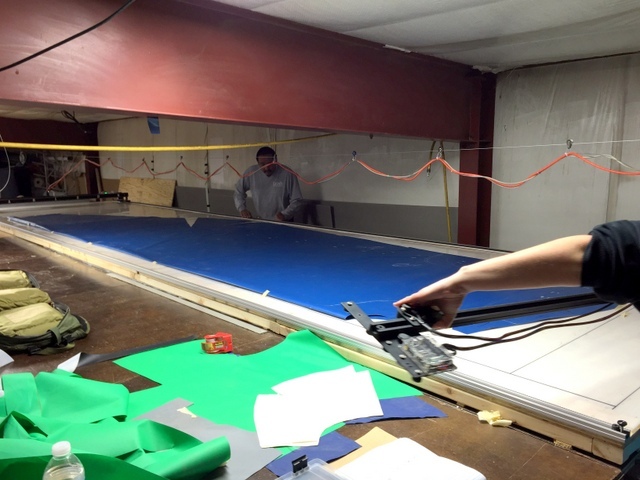 We digitized half of a 20′ boat cover in about 20 minutes. Using software, we were able to flip and cut each half in about 2.5 min — that’s down from over 2 hours. 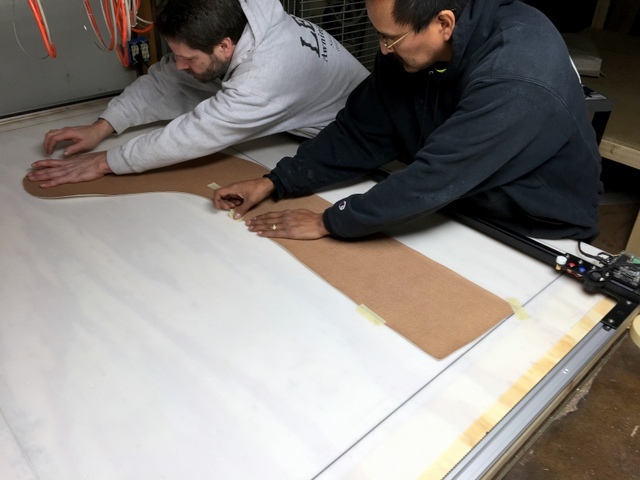 Woody and Tony prepare to digitize a 20′ long boat cover. 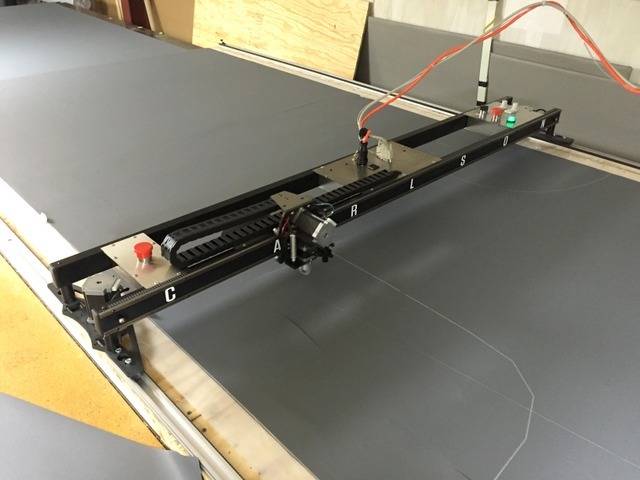 The T-Bar Digitizer rides in the same track as the Plotter/Cutter giving you a digitizing bed the size of your cutting table. This means you can digitize in real scale! The T-Bar is easily removed when finished. Darker fabric is clearly marked with a silver Sharpy. In five years they will have between 50-100 different boat models/years from just one dealership digitally stored, ready for any operator – regardless of skill level – to select the pattern file, roll out material, and hit go. Kinda makes you want to start digitizing today! It will comes as no surprise that Len’s Awning also makes…awnings! The majority their awnings consist of relatively simple domes, triangles, and rectangles. These shapes are ideal to draw using our Free Plugin to Sketchup, a free CAD program originally offered by Google. Sketchup is very easy to use for both beginners and experienced CAD operator’s. It’s a great introduction to the world of Computer Aided Design (CAD) and is a wonderful free tool to allow your operator’s to more quickly transition to more advanced programs like AutoCAD or Rhino if you decide to add a 3D Digitizing component in the future. 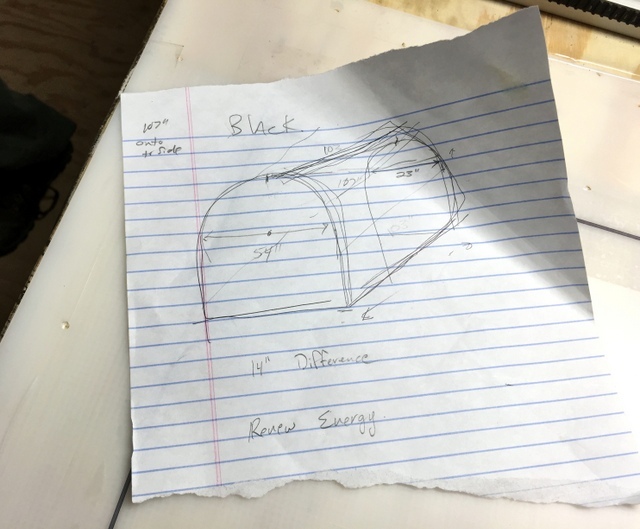 Sketchup is an easy and free CAD program that will allow you to turn basic hand sketches into ready to plot/cut awning patterns. It took Woody 20 minutes to draw his first awning. After practicing for an afternoon he cut draw time down to less than 5 minutes. Woody drew the above sketch in 20 minutes and we cut it in less than four. 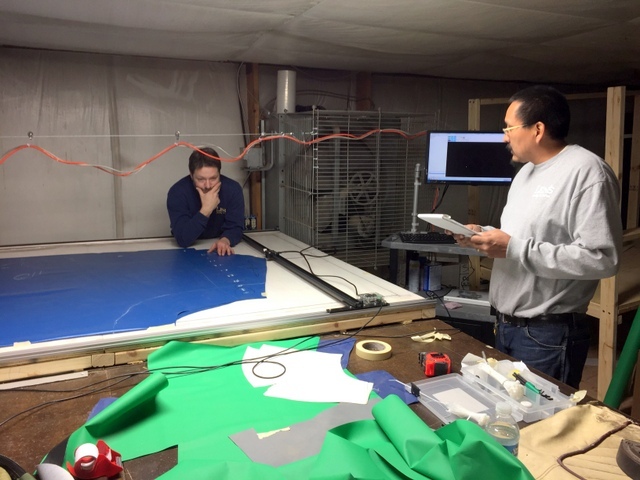 He was able to draw a more traditional 36″Hx30P”12’W awning in less than three minutes and cut in less than one. 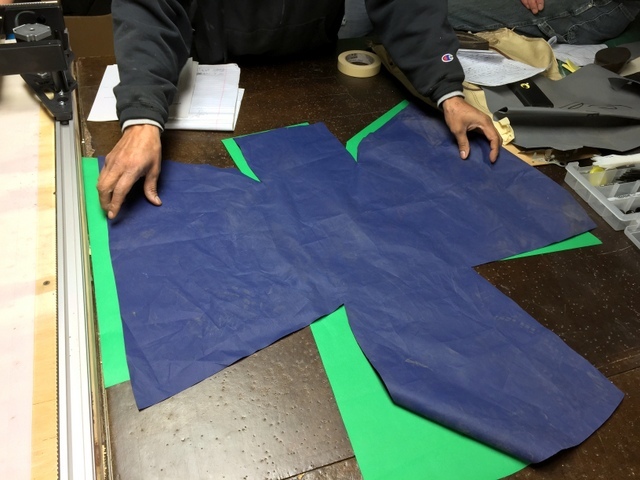 These standard patterns are now stored and ready to quickly cut or modify and then cut. This level of speed and accuracy will allow Woody to bury the sewing department this summer! 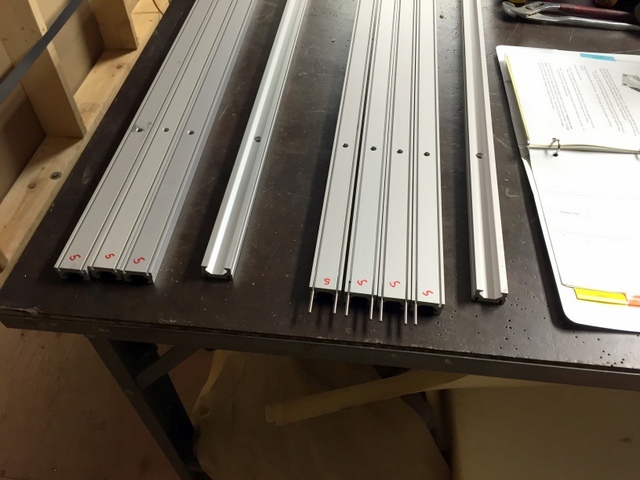 They dramatically reduced the amount of time it takes to cut trim strips. 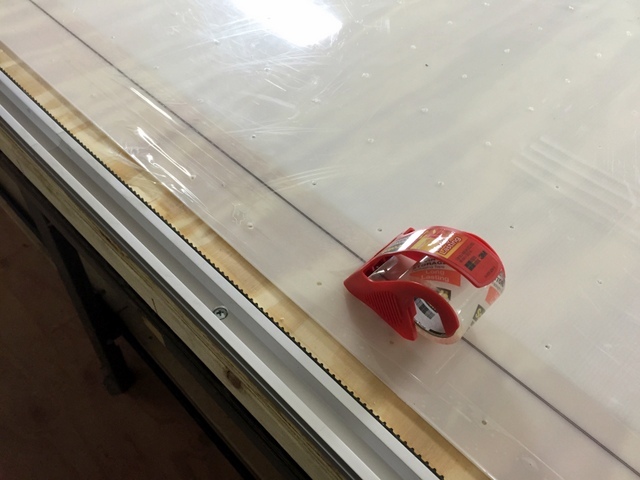 They will save hundreds of hours cutting window reinforcements with the Plotter/Cutter. Their pattern library is growing and everyone is contributing. It’s that easy. They can digitize full size, full scale boat covers. Soon they will have an enormous digital record. Awnings are quick and easy to draw in Sketchup. Everyone can start to learn CAD this way. Now let’s have a look at Len’s Awning’s unique installation. 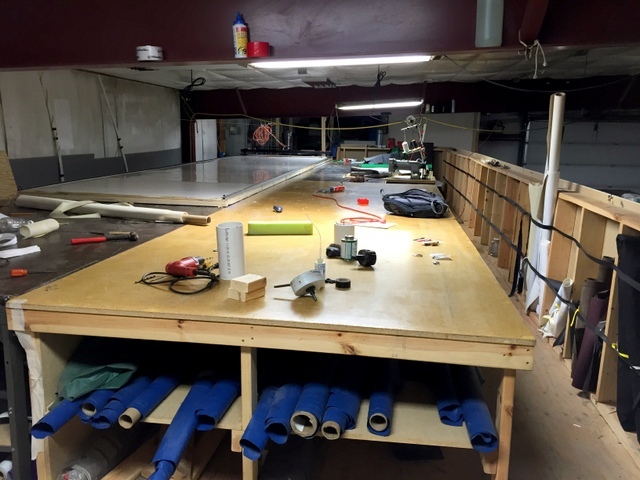 Like most awning and canvas shops, every corner of Len’s Awning shop is currently being used for something. 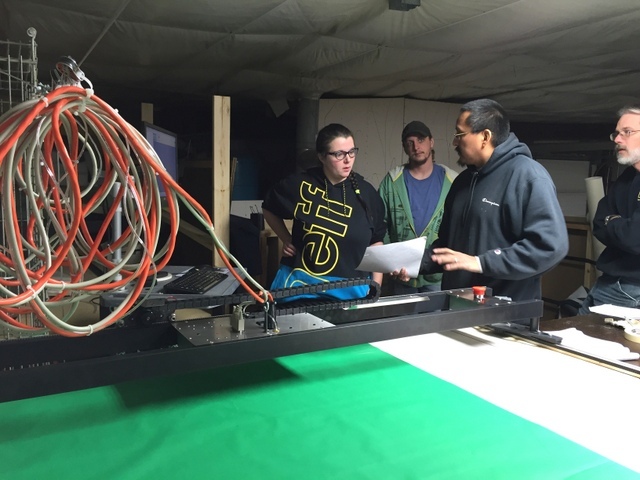 That’s why they were not thrilled at the prospect of adding a 6’x24′ table for their new Plotter/Cutter. 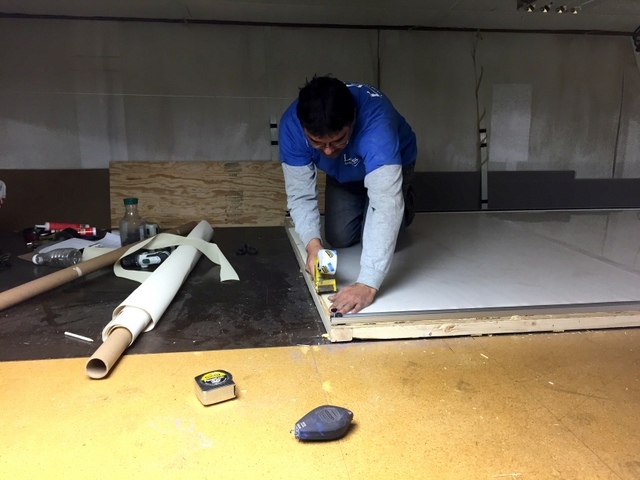 To integrate into their existing space and reduce cost we provided plans for them to build their own vacuum table. To further save space, they decided to put their Plotter/Cutter in back corner of their lofted mezzanine. 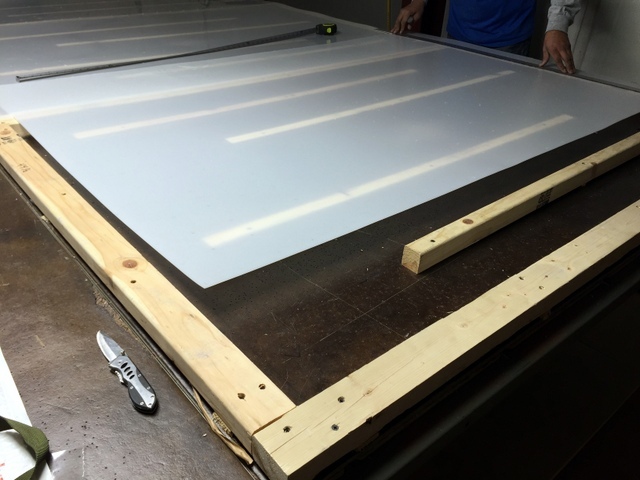 They built their new table on top of an existing steel frame table. Caulk the internal edges to prevent vacuum leaks. Before screwing the top down, be sure to take a picture of your spacer placement. 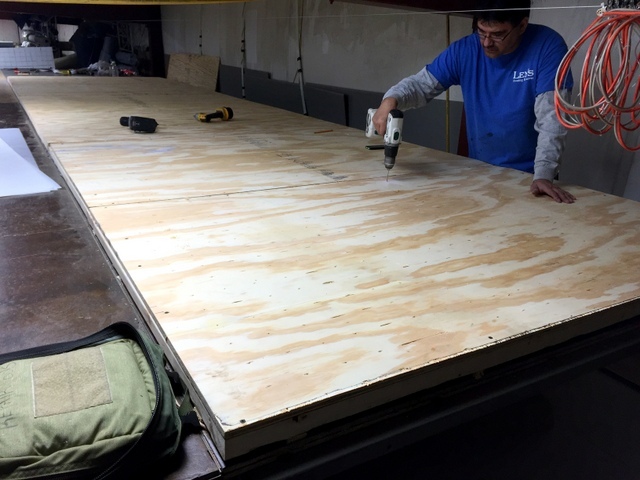 We recommend MDF tops, but it’s up to the customer to decide how they would like to build their table and they chose marine grade 3/4″ plywood. They manually drilled a 3″x3″ hole pattern with an 1/8″ bit. 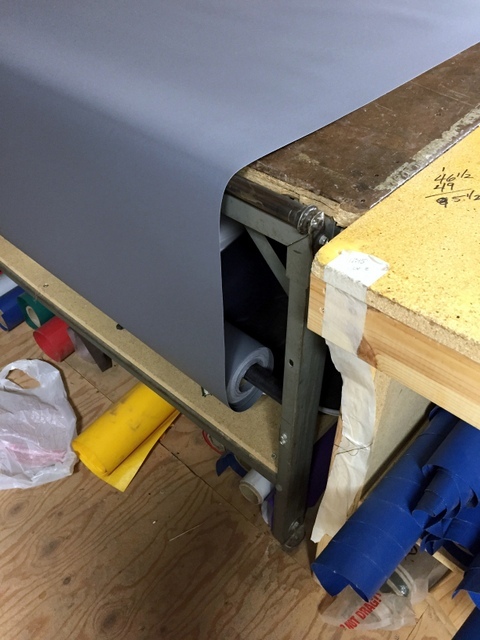 The table can be wider than the Plotter/Cutter, but it cannot be narrower. 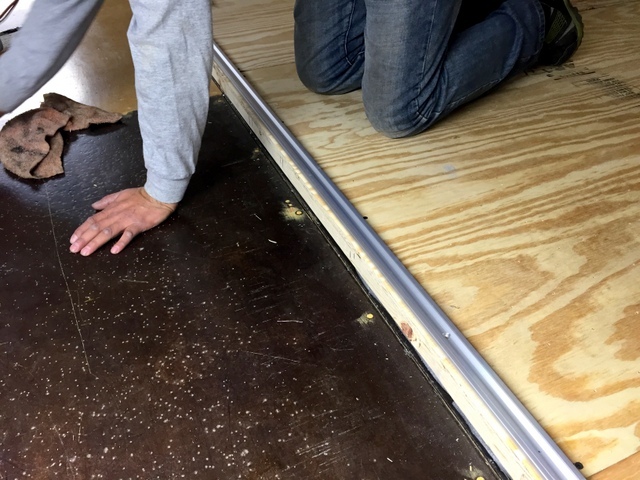 Let’s now look at the specifics for installing the Plotter/Cutter on this home-built table. Loctite track pins for side A and B. Attach track side A as straight as possible. 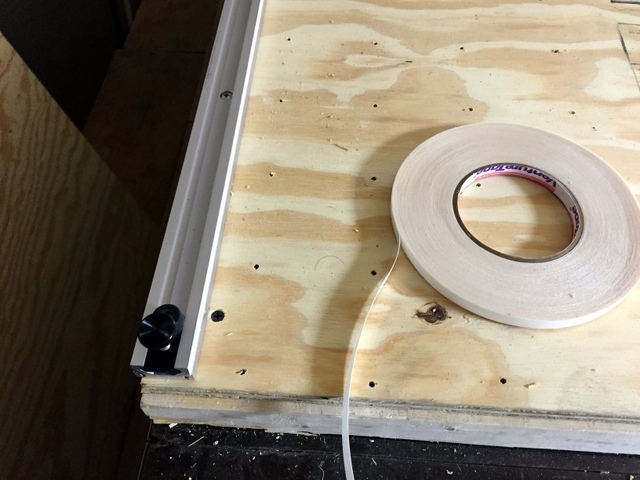 Use the Plotter/Cutter as a jig to attach side B. Running a tape measure down both sides is a great way to ensure the machine remains square throughout the track installation. 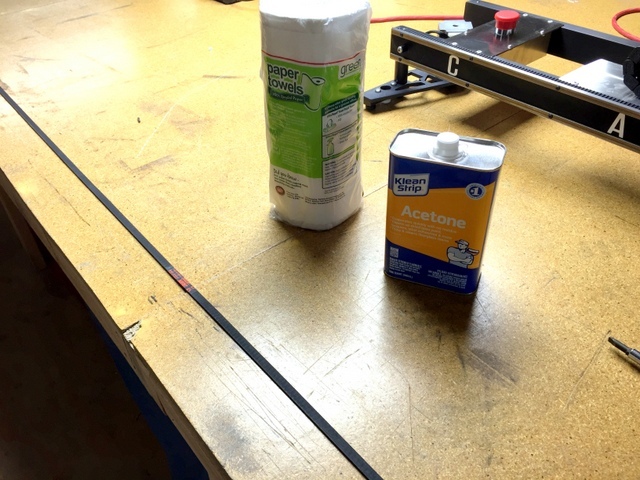 Clean track belt with acetone before applying to track with double-sided tape. Apply belt with even pressure. Cover table with a woven breather mesh and attach cutting surface. 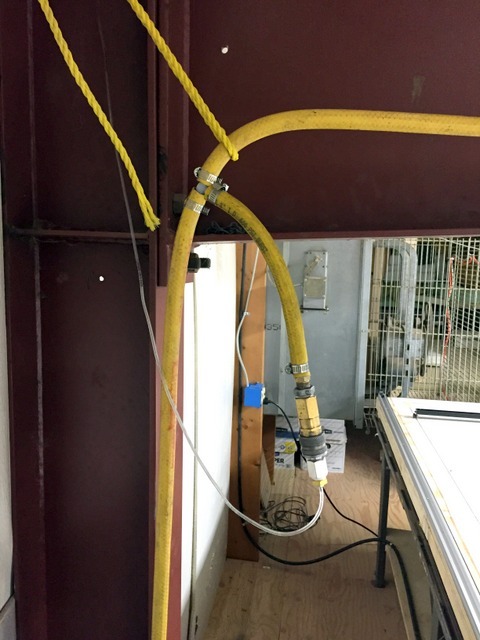 We recommend 1/16″ HDPE. Tape the cutting surface down with clear packing tape. 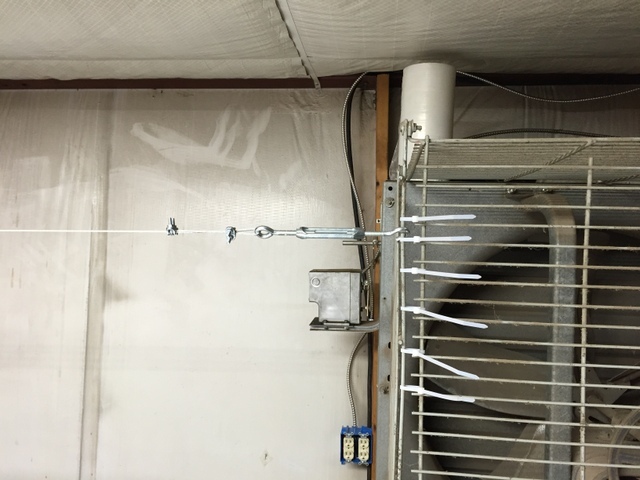 If your shop is not climate controlled this will allow the plastic surface to expand and contract with changing temperatures. 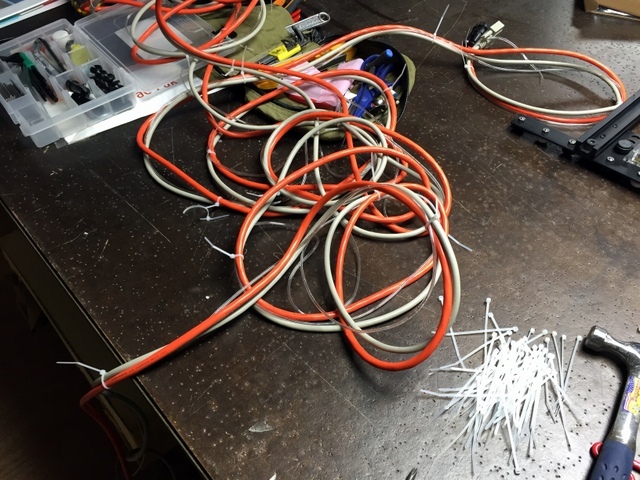 Secure power, air, and control cables together with zipties provided. Run a wire for the overhead cable. The tight space in the Mezzanine limited where we could attach their overhead cable. Use a turnbuckle to tension. 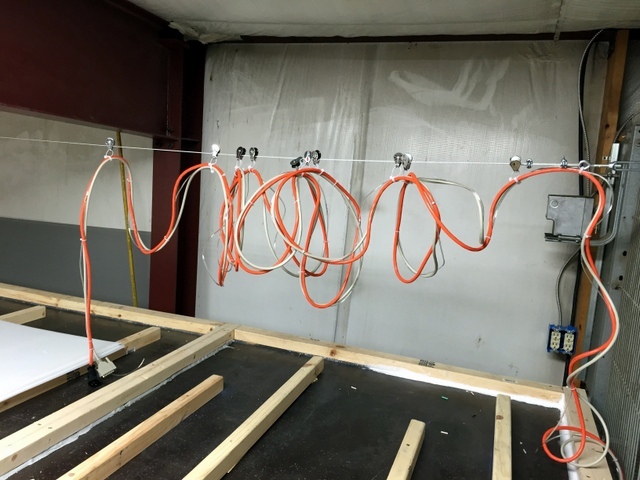 The low ceiling meant we had to double the number of pulleys used to keep the cabling above the Plotter/Cutter. 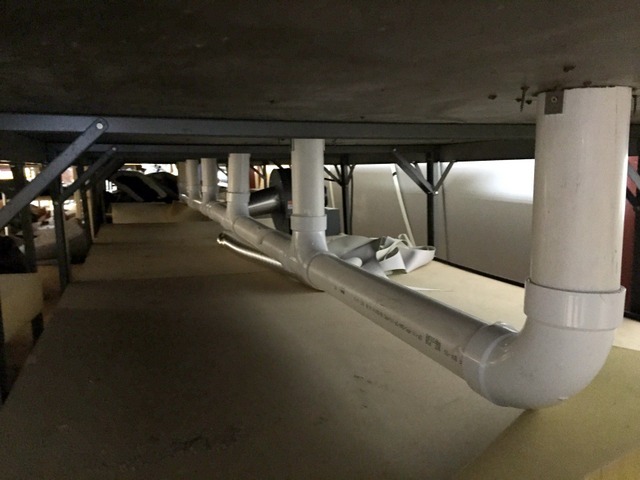 They provided their own 4″ PVC plumbing and blower. Connect to shop air. The Plotter/Cutter only requires 1CFM @ 90psi. 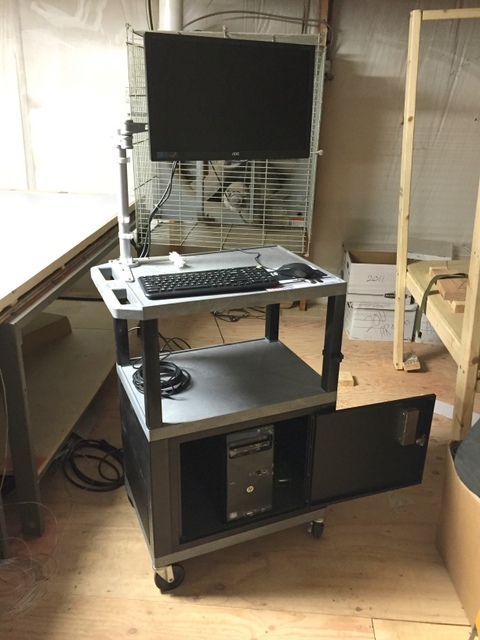 Assemble operator’s workstation with monitor. Once assembled, use the Plotter/Cutter to make a material alignment mark on the table. Cover this mark with clear packing tape to prevent it from rubbing off. They installed a fabric roll holder at the end of their table. We would like to give a big thanks to Len, Woody, Tony, Wes, Jeff, and Jen for all of their help in making this a successful install and a fun first trip to South Dakota. We look forward to following their success with automation!